Order in the next 1 hour, 16 minutes an 58 seconds for same day shipping. 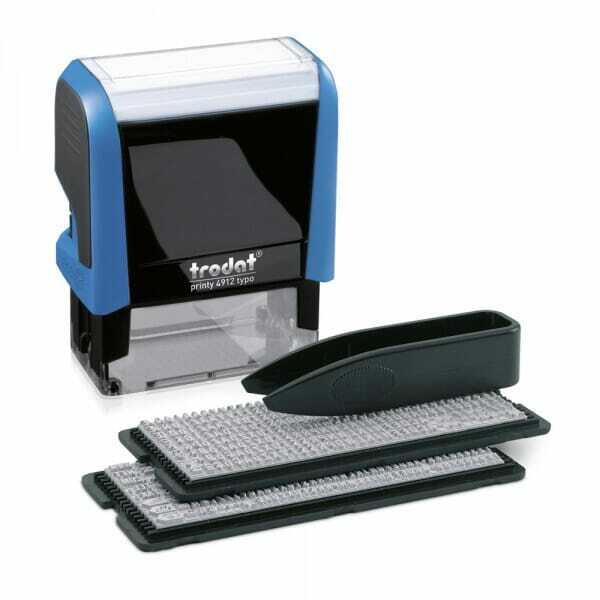 Set your own text with the Trodat Printy 4912 Do-It-Yourself stamp! The self-inking Trodat Printy Typomatic 4912T provides ultimate flexibility. The size of the impression 47 x 18 mm allows to set up to 4 lines of text. Using the enclosed tweezers, you can compose your personalised text by setting the types on the text plate. The types are re-useable - set your text and change it at any time as often as you like. Being one of Trodat's bestsellers, the stamp is climate-neutral: with maximum possible content of recycled plastic and the rest is compensated with investments in climate-protection projects. The stamp is delivered with 2 trays of type set letters with a character size of 3 and 4 mm, allowing room for either 17 or 21 letters respectively. It comes with black ink pad as standard, however suitable replacement pads 6/4912 can be ordered separately in blue, red, green or violet. Customer evaluation for "Trodat Printy 4.0 Typo 4912 - up to 4 lines of text"